The kids have been enjoying the lovely weather over the past week and have been spending more and more time out in our garden so a lot of the projects have taken a slight back seat while we all get a dose of Vitamin D. But the kids do still like pottering around the kitchen table when I am cooking their evening meal, it is a bit of a wind down and chat time for us and I have found that if I leave a few goodies out on the kitchen table they will often explore them during this time. It does not always work. Sometimes I leave some art goodies out thinking they are going to love it and no-one is interested at all. 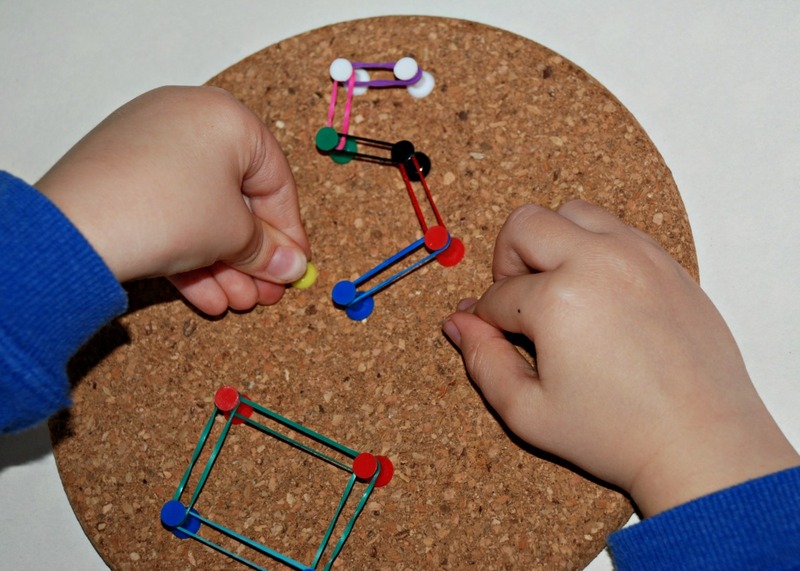 And sometimes I leave an activity out and it is a such a big hit that they are still busy when it is bedtime. 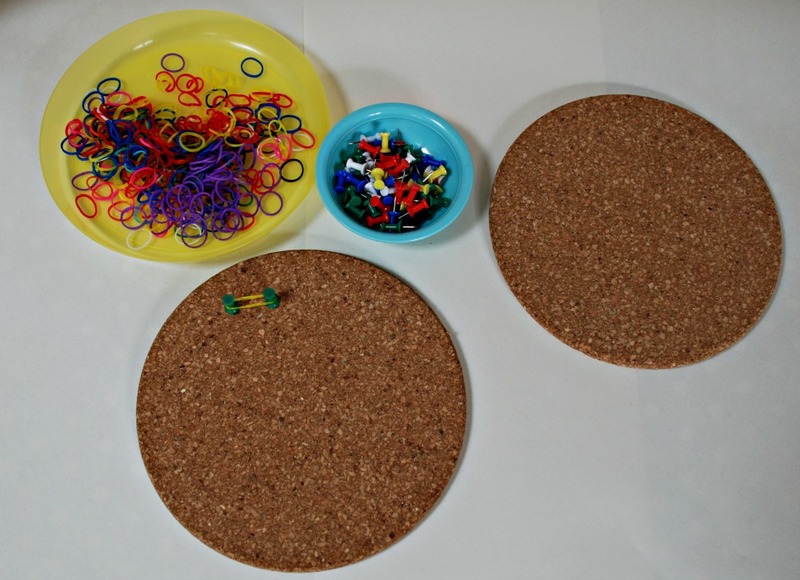 The cork coasters with drawing pins and loom bands has been on of those activities. When I first set it up I honestly did not know if they would enjoy it or not. 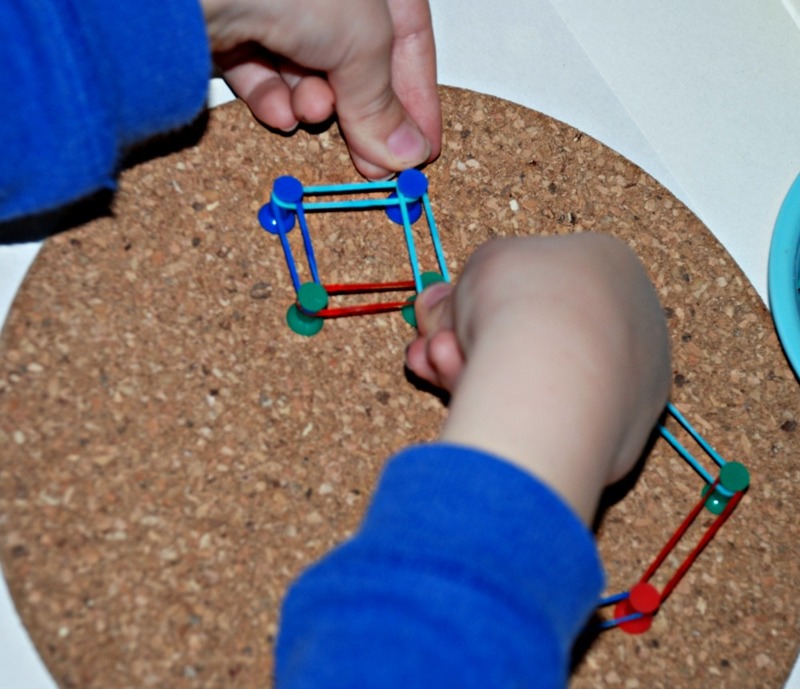 The cork coasters are either from IKEA of Tiger (I have bought a set at both stores so just not sure which ones are the ones we used in this activity). My son was the first to give it a try to he immediately started trying to create shapes. It turned out to be a great revision of 2D shapes for him as he had to check what a few of the bigger shape names were. 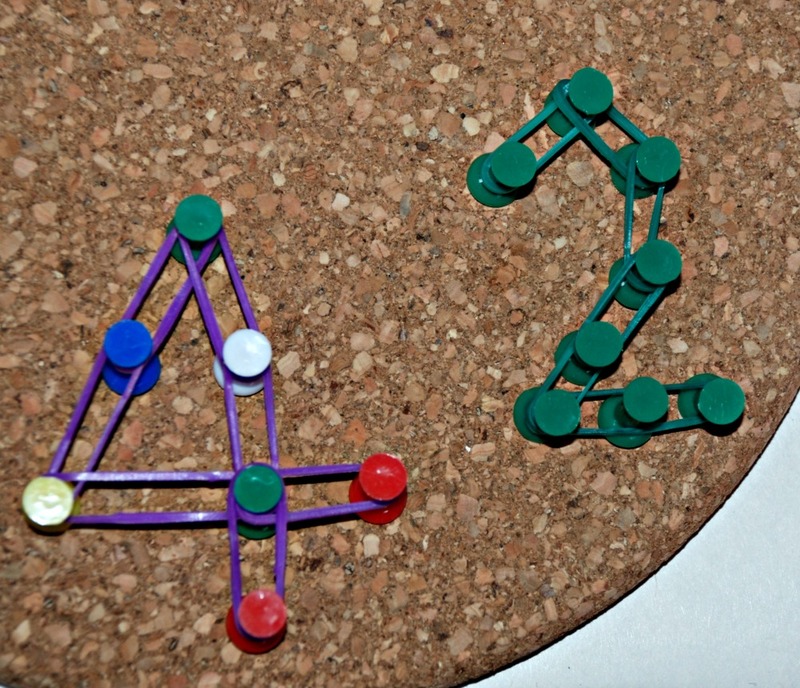 My daughter did a few shapes but she quickly moved onto creating numbers. The 5 below took 3 attempts to get it just the way she wanted but once she got a hang of it there was no stopping her and she did a bunch of numbers. (Tip from my daughter – when you need to place the drawing pins close together to get the right shape it helps to loop the loom band over twice). My youngest naturally could not resist copying his big sister and he also had a go at numbers. He started off creating his first number backwards but he realised before he had finished the number and redid the number. 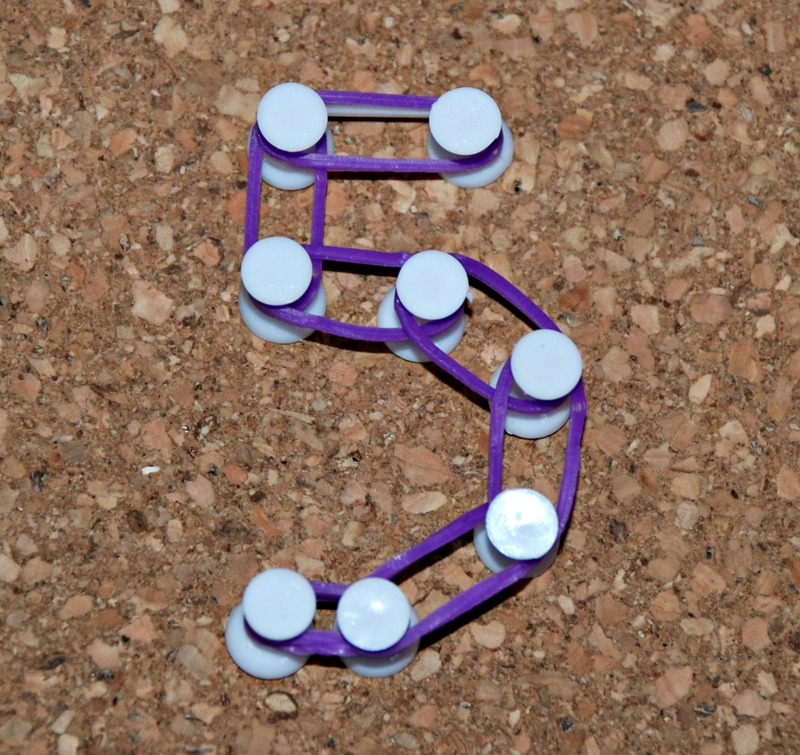 They have since done more numbers – I actually really like it as a number formation exercise for my youngest. My daughter has tried a few patterns but nothing that she is happy with – yet. 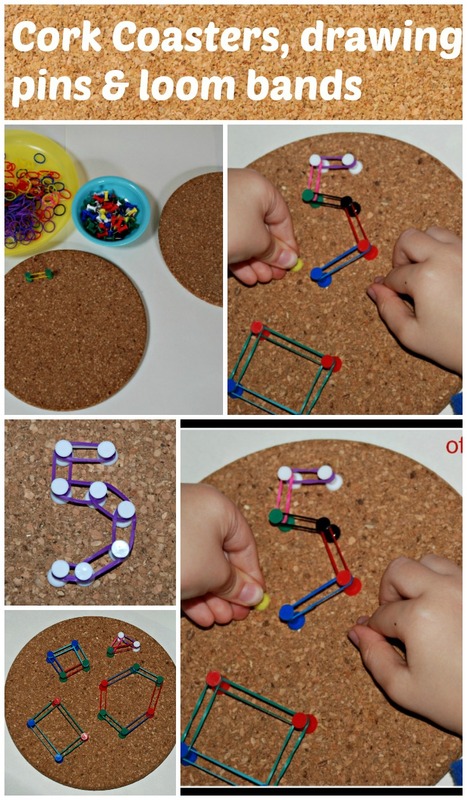 And we have not tried letters yet but I am sure it would work really nicely for letter formation as well. 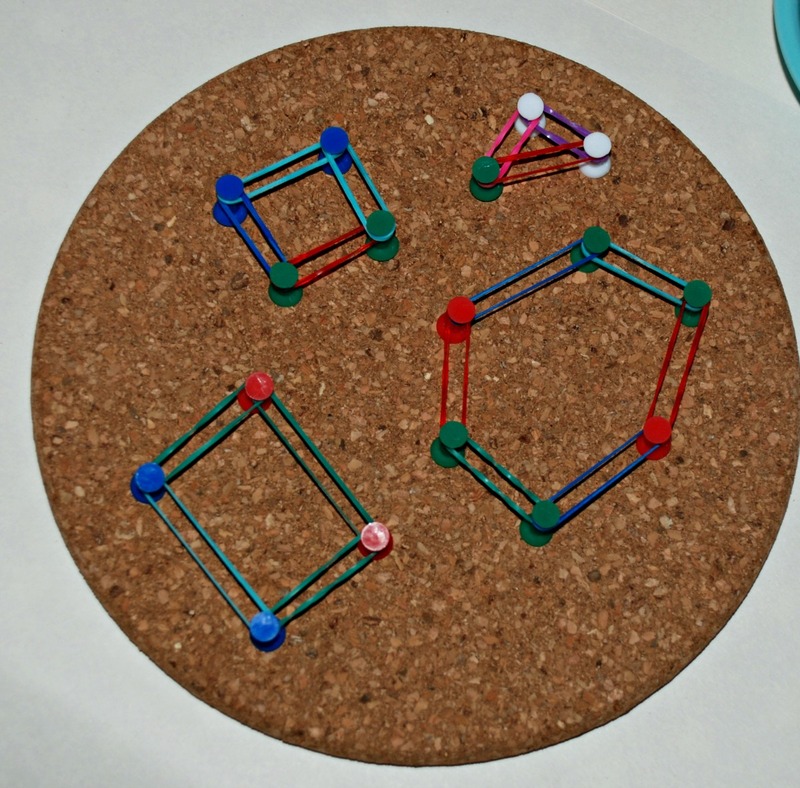 This entry was posted in Homeschooling and tagged 2D shapes, children's craft, cork coaster activity, home ed, home education, homeschooling, number formation. Bookmark the permalink.